a birthday cake for prince charming. The recipe for the Hummingbird Cake is said to have been first published in 1978 by the Southern Living magazine, and it has ever since become a staple in the Southern US cuisine. Packed with exotic flavours, this cake relies on a rather unusual combination of ingredients, starting with the fact that it asks for more fruit than flour. With banana, pecans and pineapple at its core, it's easy to imagine a dense cake with a compact crumb, however, this cake, will prove you wrong: it has a deliciously tender and slightly moist texture, which is just compact enough to make it a perfect candidate for layering and frosting! My staple mascarpone frosting is in the sweet spot between whipped cream and cream cheese, with a hint of lemon, vanilla and maple syrup, and the whole thing is taken to new heighs by all that caramel dripping on top! This cake had such wonderful layers of flavours that each bite was a different experience of yumminess. And on top of all, I can't help but being super proud of how gorgeous my first semi-naked cake turned out! Oh, Prince Charming. I could tell you one thing: he is irresistibly handsome. But besides that already being at plain sight for anyone to see, saying only that would not make him any justice. I see so much more than that. I see a genuinely good heart. I see a fascinating mind and a great sense of humor. I see someone who is passionate about life and commited to making the most out of it, while not falling into the trap of taking it all too seriously. I guess I could go on for a while and be left here blushing, but I will leave the rest to him only. And you know what... how we just tune into each other... is just The best thing. 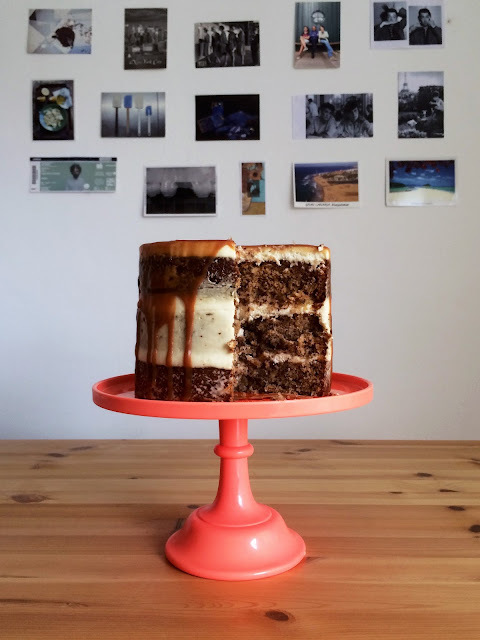 After the usual ordeal of choosing a single cake to bake, having considered simple vanilla, intense chocolate and different nut cakes, the Hummingbird cake suddenly came to my mind and stuck there, just because I imagined it would go great with caramel, which had been my starting point for the whole birthday cake thing. I know, I know, it's just the sauce, but the thing is... first of all, that is definitely not just a sauce, and second, my goal was to make something with that sauce, because I was sure the B-Day man would totally dig it just as much as me. (And boy, was I not right...?). The mascarpone frosting then flew over from a chocolate layer cake I made last year (a total blast), for its taste and texture ambiguity - is it cream? is it cheese? - in an attempt to mimic a caramel-vanilla ice-cream base and still hold onto the traditional cream cheese frosting. And despite not being sure whether the texture of the cakes would hold and be fit for triple layering, I had was already sold on the idea. If you have always admired the gorgeousness of a naked or semi-naked cake from afar, this is your time to try making one! I can assure you that it is not that hard. Don't be put off by the size of my post: it is big because I loaded it with tips for you to get the best results out of your cake. You can do it! Happy baking! Preparar os três bolos no dia anterior, ou pelo menos umas duas horas antes. Aquecer o forno a 180º na grelha de cima. Espalhar as nozes pecan sobre um tabuleiro forrado com papel vegetal e levar a assar cerca de 8 minutos, para torrarem. Retirar do forno, deixar arrefecer e picar bem fino. Reservar. Mudar o forno para a ventoinha, mantendo a temperatura. Escolher uma forma de bolos de fundo amovível com 18cm de diâmetro. Utilizar o aro para recortar 3 círculos de papel vegetal com o mesmo diâmetro. Untar a forma com manteiga e forrar o fundo com um círculo de papel, untando-o também. Caso se tenha três formas iguais à disposição, preparar todas da mesma forma; caso se tenha apenas uma, será necessário desenformar o bolo, lavar a forma e voltar a preparar para assar o bolo seguinte. Numa taça grande, misturar a farinha peneirada, o bicarbonato, o sal, a canela, a noz moscada e os açúcares. Numa segunda taça, misturar a baunilha, os ovos e o óleo. Verter a mistura de ingredientes líquidos sobre os ingredientes secos e misturar bem com uma colher de pau. Juntar a banana, o ananás e as nozes e envolver tudo muito bem até obter uma massa homogénea bem espessa. Dividir a massa em três partes iguais, utilizando uma concha da sopa grande ou uma chávena como medida. Utilizei cerca de 3 chávenas rasas de massa para cada camada de bolo. Caso sobre um pouco de massa, pode-se por exemplo fazer muffins com a mesma. Verter uma parte da massa na forma e levar ao forno cerca de 30 minutos, ou até que um palito enfiado no centro saia seco. Retirar do forno e deixar arrefecer na forma cerca de 15 minutos. Desenformar, lavar a forma e preparar a mesma para novo bolo e repetir o processo. Enquanto se prepara os bolos, é importante manter a massa restante sempre coberta ou hermeticamente fechada no frigorífico. Colocar os bolos prontos em diferentes redes ou superfícies e remover o papel vegetal. Deixar arrefecer completamente (pelo menos uma hora ou de um dia para o outro). Numa panela sobre lume médio, derreter o açúcar com a água, mexendo regularmente, até obter uma cor âmbar e um aroma de caramelo. Juntar a manteiga e logo de seguida misturar energeticamente com um fouet. Incorporar as natas da mesma forma. Por fim, incorporar o sal e a baunilha. Levar ao lume mais 5 minutos, mexendo sempre. Verter numa taça funda resistente ao calor e deixar arrefecer completamente. Bater o mascarpone com as natas, o aroma de baunilha, o xarope de ácer e o sumo de limão. Juntar aos poucos o açúcar em pó, batendo sempre bem entre adições, até obter a espessura desejada. Levar ao frigorífico 15 minutos. Manter no frio se não for para utilizar imediatamente, retirando cerca de 15-30 minutos antes de usar. Cortar os topos de todos os bolos com um cortador de forma a que as três camadas fiquem com a mesma espessura. Colocar a primeira camada de bolo sobre uma base apropriada para a montagem. Encher um saco de pasteleiro com um bico redondo largo com o creme de mascarpone. Fazer um círculo a toda a volta do topo do bolo, deixando cerca de meio centímetro até à borda do bolo. Preencher o espaço central com mais creme. Espalhar e distribuir homogeneamente com uma espátula. Colocar a segunda camada de bolo sobre o creme e repetir o processo para a segunda camada de creme. 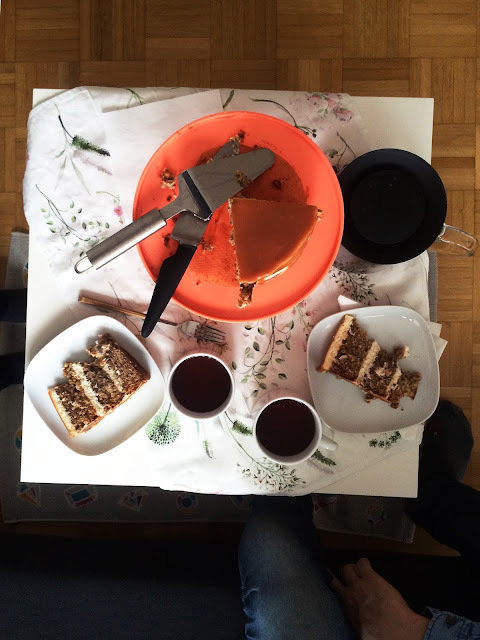 Terminar com a terceira camada de bolo. Pressionar tudo ligeiramente e verificar se o bolo está nivelado e direito. Colocar uma última camada de creme sobre a terceira camada e espalhar com uma espátula de forma a obter uma superfície nivelada e bem lisa. Agora a parte mais divertida: juntar algum frosting aos lados do bolo de forma irregular, em particular a buracos ou irregularidades, espalhar mais ou menos, e depois, fazendo pressão com o lado de espátula contra este, girá-lo, de forma a remover parte deste do bolo, para obter o efeito semi-naked. Caso esteja calor ou tempo húmido, levar o bolo ao frio cerca de meia hora. Encher o jarro com algum do molho de caramelo e verter sobre o topo do bolo, deixando o molho espalhar-se até às bordas. Verter devagar algum molho perto das bordas em pontos específicos, para obter o efeito de gotas a escorrer. O molho continua a descer durante alguns minutos, pelo que convém não exagerar na quantidade. Reservar o restante molho num recipiente hermeticamente fechado. Levar o bolo ao frigorífico durante pelo menos meia hora. Se deixado mais tempo, retirar pelo menos 2 horas antes de servir. Bake the three cakes one day ahead, or at least a couple of hours. Pre-heat the oven at 180ºC on the top grill. Spread the pecans over a parchment paper lined tray and roast for about 8 minutes. Remove from the oven, let cool and chop very thinly. Set aside. Change the oven to the fan mode, keeping the temperature. Pick a 18cm springform cake pan. Use it to cut three 18cm parchment paper circles. Close and butter the pan, fit one circle of paper on the bottom and butter on top of it too. In case you have three pans available, get them all ready the same way; if you only have one pan, no worries, but you will need to remove the cake from the pan, wash it and prepare it again for each next cake. In a big bowl, mix sifted flour, baking soda, salt, cinnamon, nutmeg and all the sugar. In a second bowl, mix vanilla, eggs and oil. Pour the liquid ingredients over the dry mixture and combine well with a wooden spoon. Add the banana, pineapple and chopped pecans and mix well until reaching a thick homogeneous batter. Divide the batter in three equal parts, using a cup or another measuring device for it. I used a soup serving spoon and measured three for each cake. If there is a bit of batter left you can use it to make muffins, they will be delicious. Pour the first part of batter in the springform pan and bake for about 30 minutes, or until a toothpick inserted in the center comes out clean. Remove from oven and let cool in the pan for about 15 minutes. Remove the cake from the pan, wash the latter, get it ready for a second cake and repeat the process. While baking the cakes, it is important to keep the batter covered in the fridge. Place the cakes over cooling racks and remove the parchment paper. Let cool completely (at least one hour or overnight). In a saucepan over medium heat, melt sugar with water, stirring every once in a while, until reaching an amber coloured liquid mixture with a caramel scent. Add the butter and immediately whisk with vigour. Add the cream the same way. At last, stir in the salt and vanilla. Heat for another 5 minutes, while stirring. Pour into a heatproof recipient and let cool completely. Cream the mascarpone with the heavy cream, vanilla, maple syrup and lemon juice. Slowly add the confectioner's sugar while beating, until reaching the desired consistency. Place in the fridge for about 15 minutes. If not using immediately, keep in the fridge until 15-30 minutes before needed. Cut the tops of the cakes with a cake cutter so that the three layers are leveled and have the same height. Place the first layer of cake on the decorating stand. Fill the piping bag with the frosting. Make a circle of frosting all around top of the cake, leaving half centimeter to the edge. Fill the inner space with more frosting. Spread evenly with a spatula. Place the second layer of cake on top of that, ensuring everything is evenly leveled, and repeat. Finish with the third layer of cake. Lightly press everything together and check if the cake is leveled and straight. Spread a third layer of frosting on the top of the third layer of cake, making sure it is thick, leveled and smooth. Now the best part: add some frosting to the sides of the cake in an irregular fashion, particularly covering holes and any unevenness, spread roughly and then, holding the side of a spatula against the side of the cake, scrape the frosting off the cake while turning it, to obtain the semi-naked effect. In case the weather is hot and/or humid, place the cake in the fridge for about half an hour. 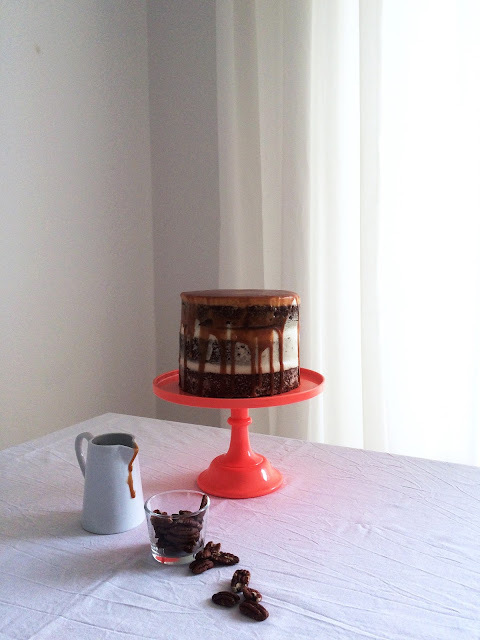 Fill the jug with some caramel sauce and pour it over the cake, letting the sauce spread to the edges. Slowly pour some sauce in specific areas near the edge, to obtain the dripping effect. The sauce will keep dripping down for a while, hence one must not pour too much of it on top of the cake. Keep the remaining sauce in an airtight container. Place the cake in the fridge for about half an hour. If leaving the cake longer there, remove from the fridge at least 2 hours before serving. wish you sweet cake dreams of weekend! Ps: Adorei as chávenas da última fotografia, muito fofas. Um enorme e maravilhoso bolo! Simplesmente perfeito, parabéns! Adorei o bolo! E esse frosting está barrado de uma maneira super espetacular que eu gostaria de saber fazer. Adoro bolos altos decorados de uma forma simplista! Adoro o bolo, os sabores! Óptima escolha!! Adoro este género de bolos mas o que tentei fazer uma vez não correu assim tão bem! 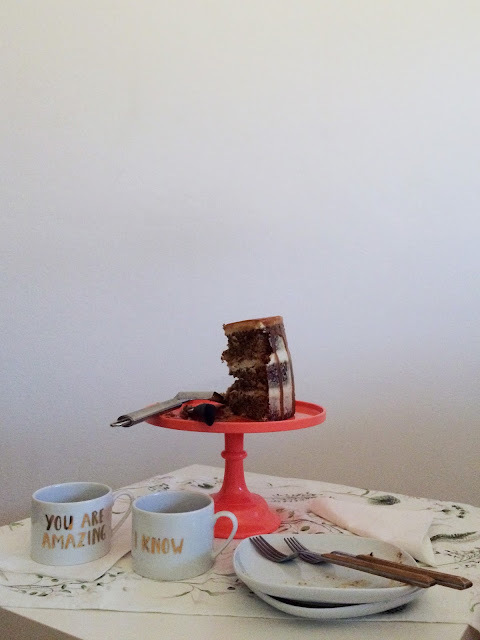 Gosto imenso do cake stand :D que cor gira! Tenho a certeza que o "príncipe" adorou! Fiquei completamente derretida com este teu bolo. Além de estar lindo é simplesmente dos meus bolos favoritos! Olá Inês: adoro este bolo pois já o fiz, embora o meu não tenha ficado assim maravilhoso! É mesmo para ficares orgulhosa,pois está um trabalho primoroso! Parabéns. Adorei as fotos onde se nota todo o empenho na realização deste bolo.Ficou lindo e cada fatia é uma perdição! Um bolo digno de um príncipe, ficou lindíssimo! Estive a ler os ingredientes da massa, deve ficar com um jogo de aromas muito interessante e especial. Gostei mesmo muito.